Whether your business is rapidly growing or your current workspace simply isn’t cutting it, an office refurbishment can have a huge impact on your organisation. Whether it is a small spit and polish or full office make-over, we can deliver the look you need. Not only can it dramatically improve staff motivation, but it can also improve how clients perceive your brand and provide holistic benefits for your business. We can transform your working environment as well as your potential for business growth. We keep this in mind whenever we provide an office refurbishment in Melbourne, basing our approach on the client’s objectives and how we can optimise a given office to achieve these goals. We understand that it’s important for an office refurbishment, just like anything else in your business, to stay within budget. Our team has years of experience working on projects of all sizes and has gained the knowledge to tailor cost-effective solutions that achieve the best possible outcome. At the concept stage, we focus on understanding what you need in a workspace and why your current office isn’t doing enough. From there, we’ll work closely with you from initial planning and interior office design through to construction and furnishing to produce a fully renovated or refurbished workspace that helps you drive success. We can even create custom office joinery to ensure the space looks and feels just how it should. 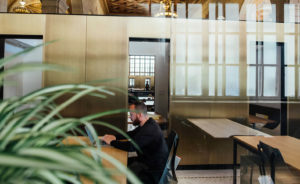 Even if your current workspace is in dire need of a makeover, we understand that it can be daunting to face the potential downtime for your business. That’s why we always go above and beyond to ensure any office refurbishment in Melbourne goes as quickly and smoothly as possible. While it’s difficult to completely remove disruptions due to the nature of the renovation, we work hard to identify ways in which we can minimise any hindrance to your normal operations and protect your bottom line. Get in touch today and discover how Office Fitout Solutions can provide you with a stress-free office refurbishment.